This is the desert version of the HMH-361/15th MEU OIF 2003 Detachment patch. It states "Cowboys with the Power of God"
This is the color version of the squadron patch for the HMH-361 'Pineapples' that operate under MAG-16 and fly the Sikorsky CH-53E Super Stallion out of MCAS Tustin, CA. They formerly flew the CH-53E Sea Stallion until Sept. 1990, but since transitioned to their current configuration. This is the subdued version of the squadron patch for the HMH-361 'Pineapples' that operate under MAG-16 and fly the Sikorsky CH-53E Super Stallion out of MCAS Tustin, CA. They formerly flew the CH-53E Sea Stallion until Sept. 1990, but since transitioned to their current configuration. 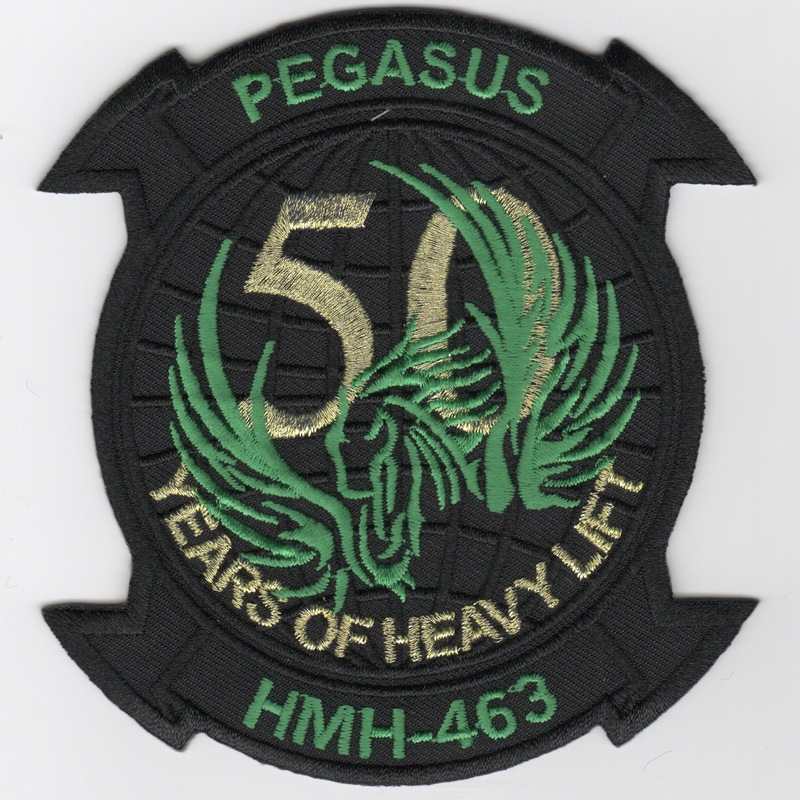 This is the MH-53E "Long Range-Heavy Lift" patch for the "workhorse" of the Navy and for HMH-361. This is the desert version of the MH-53E "Long Range-Heavy Lift" patch for the "workhorse" of the Navy and for HMH-361. 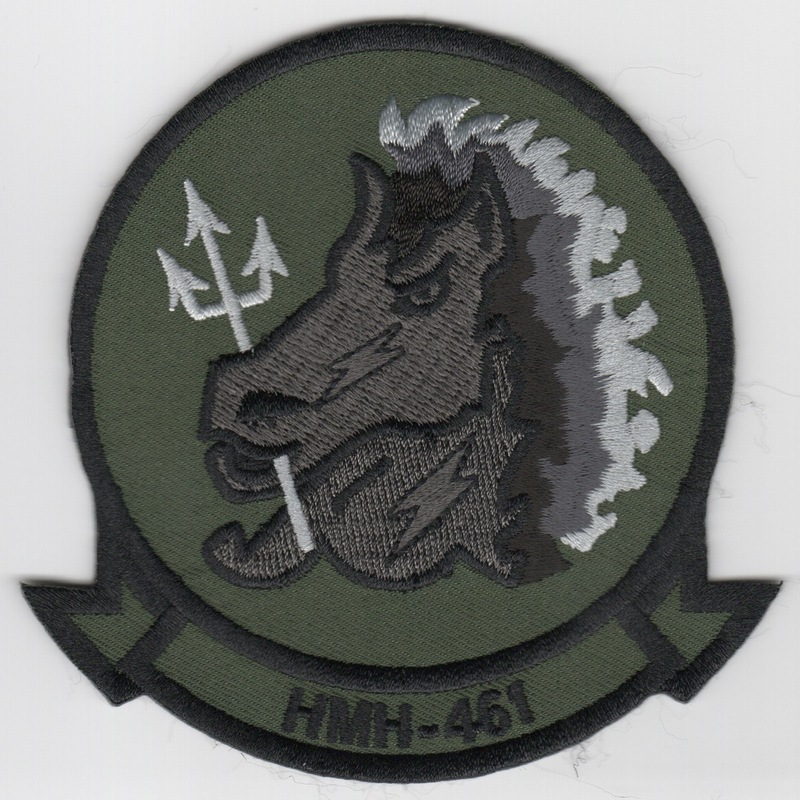 This is gray version of the "Heavy Metal" version of the MH-53E "Long Range-Heavy Lift" patch for the "workhorse" of the Navy and HMH-361. It states "Flying Tigers" along the top and "Heavy Metal IRAQ 2006" along the bottom. This is desert version of the "Heavy Metal" version of the MH-53E "Long Range-Heavy Lift" patch for the "workhorse" of the Navy and HMH-361. It states "Flying Tigers" along the top and "Heavy Metal IRAQ 2006" along the bottom. This is the color version of the squadron patch for the HMH-362 'Ugly Angels' flying the CH-53D Sea Stallion under MAG-26 guidance in support of the 2nd Marine Division out of Camp Lejeune, NC. This is the subdued version of the squadron patch for the HMH-362 'Ugly Angels' flying the CH-53D Sea Stallion under MAG-26 guidance in support of the 2nd Marine Division out of Camp Lejeune, NC. This is the squadron patch for the HMH-363 'Red Lions' that operate under MAG-16 and fly the Sikorsky CH-53E Super Stallion out of MCAS Tustin, CA. This is the subdued version of the squadron patch for the HMH-363 'Red Lions' that operate under MAG-16 and fly the Sikorsky CH-53E Super Stallion out of MCAS Tustin, CA. Marine Heavy Helicopter Squadron 461 (HMH-461) is a United States Marine Corps helicopter squadron consisting of CH-53E Super Stallion transport helicopters. The squadron, known as "Ironhorse", is based at Marine Corps Air Station New River, NC and falls under the command of Marine Aircraft Group 29 (MAG-29) and the 2nd Marine Aircraft Wing (2nd MAW). This is the "blue/yellow" version with the Silver horsehead and does not come with velcro attached. Marine Heavy Helicopter Squadron 461 (HMH-461) is a United States Marine Corps helicopter squadron consisting of CH-53E Super Stallion transport helicopters. The squadron, known as "Ironhorse", is based at Marine Corps Air Station New River, NC and falls under the command of Marine Aircraft Group 29 (MAG-29) and the 2nd Marine Aircraft Wing (2nd MAW). This is the "subdued" version with the dark gray horsehead and does not come with velcro attached. Marine Heavy Helicopter Squadron 461 (HMH-461) is a United States Marine Corps helicopter squadron consisting of CH-53E Super Stallion transport helicopters. The squadron, known as "Ironhorse", is based at Marine Corps Air Station New River, North Carolina and falls under the command of Marine Aircraft Group 29 (MAG-29) and the 2nd Marine Aircraft Wing (2nd MAW). This is their "HERITAGE" patch for HMR(M)-461. It does not have velcro attached. 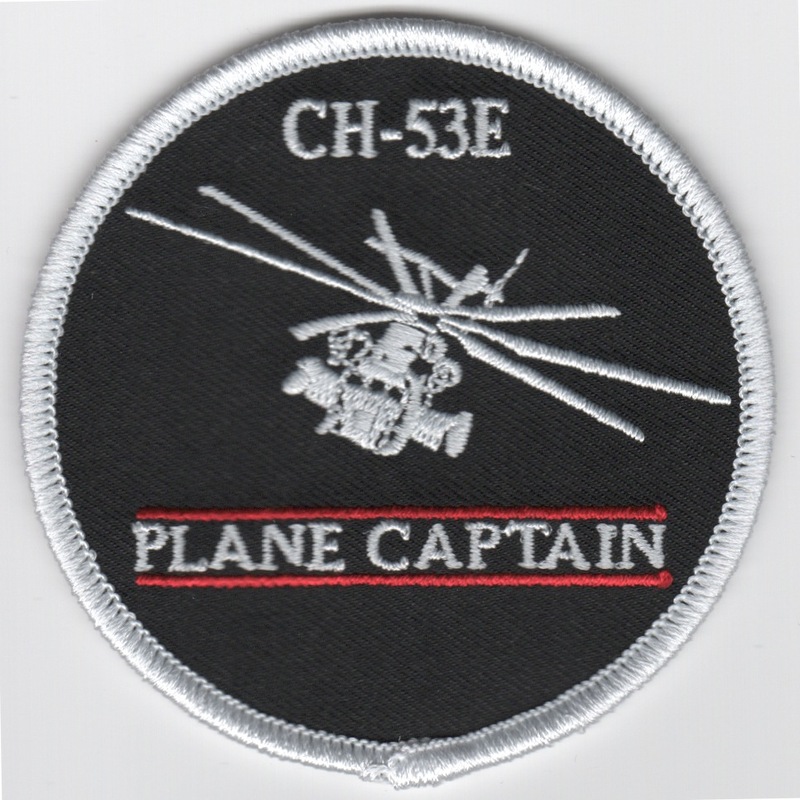 This is the black version of the "Plane Captain" patch for the CH-53E patch worn by those who work on the squadron's aircraft. It does not have velcro attached. 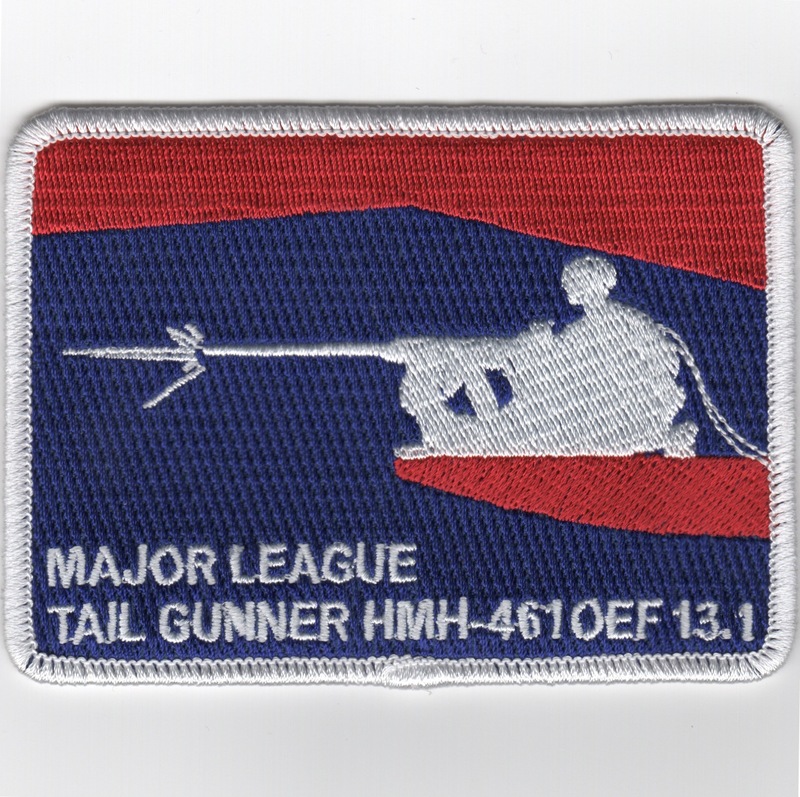 This is the "Tail Gunner" patch for the HMH-461 Squadron and says "Major League". It also says "OEF 13.1", insinuating the "halfway" point of their "marathon" deployment. 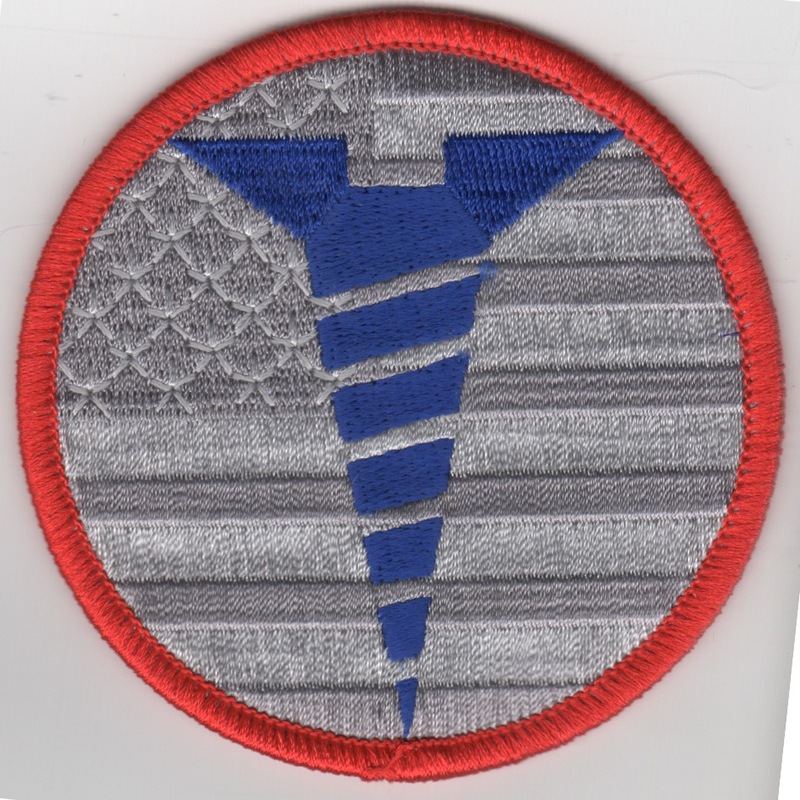 This is the desert version of the squadron's "halfway" patch. It also says HURRICANE at the top and shows Poseiden with his Trident. Marine Heavy Helicopter Squadron 461 (HMH-461) is a United States Marine Corps helicopter squadron consisting of CH-53E Super Stallion transport helicopters. The squadron, known as "Ironhorse", is based at Marine Corps Air Station New River, North Carolina and falls under the command of Marine Aircraft Group 29 (MAG-29) and the 2nd Marine Aircraft Wing (2nd MAW). 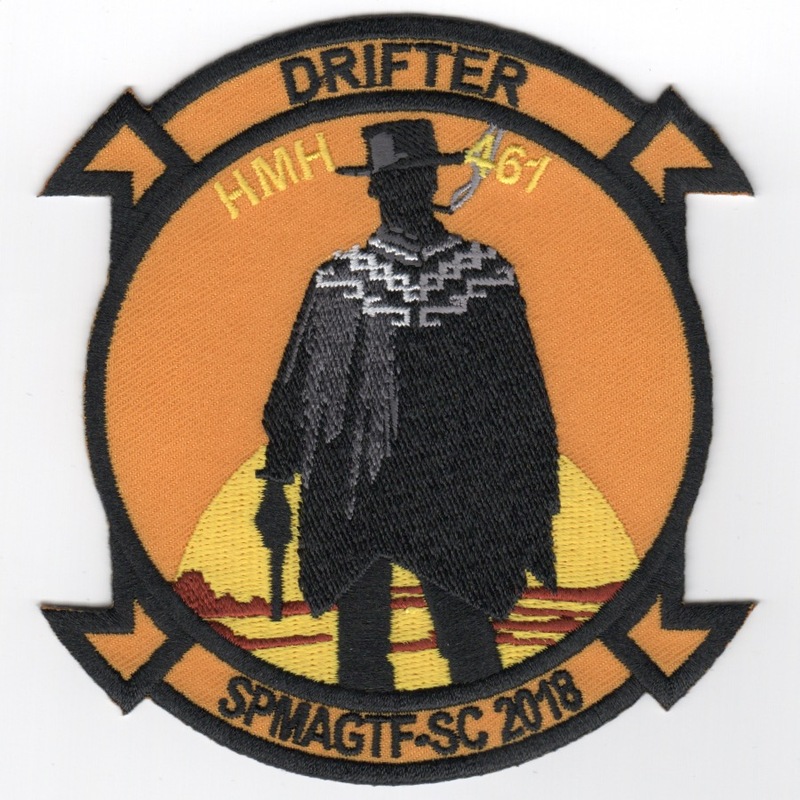 This is the DET patch created for HMH-461 2018 SPMAGTF-SC 'DRIFTER' detachment. It shows the (in my opinion) 'Outlaw Josey Wales'. This patch does not have velcro attached. This is the color version of the squadron patch for the HMH-462 'Heavy Haulers' out of MCAS Tustin, CA. They operate under the watchful eyes of MAG-16 and fly the Sikorsky CH-53A Sea Stallion transport helicopter in support of US Ground Forces. They were deployed to King Abdul Aziz naval air base, Saudi Arabia for Operation Desert Storm. 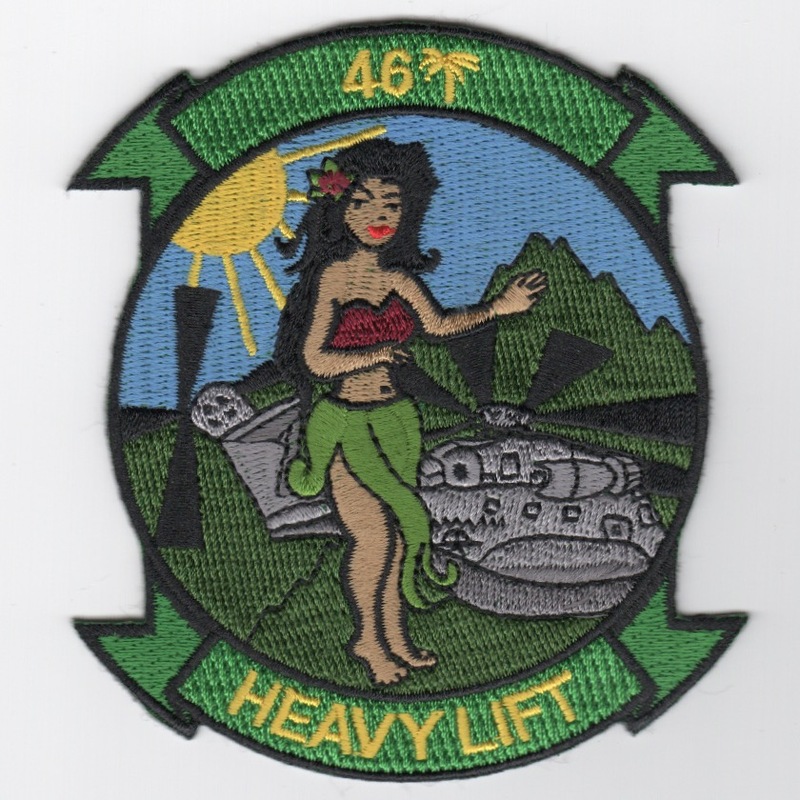 This is the subdued version of the squadron patch for the HMH-462 'Heavy Haulers' out of MCAS Tustin, CA. They operate under the watchful eyes of MAG-16 and fly the Sikorsky CH-53A Sea Stallion transport helicopter in support of US Ground Forces. They were deployed to King Abdul Aziz naval air base, Saudi Arabia for Operation Desert Storm. This is the "screwed" patch for the HMH-462 'Heavy Haulers' out of MCAS Tustin, CA. They operate under the watchful eyes of MAG-16 and fly the Sikorsky CH-53A Sea Stallion transport helicopter. It shows a blue screw on a gray American flag and does not come with velcro attached. This is the color version of the squadron patch for the HMH-463 'Pegasus' out of MCAS Tustin, CA. They operate under the watchful eyes of MAG-16 and fly the Sikorsky CH-53A Sea Stallion transport helicopter in support of US Ground Forces. They were deployed to King Abdul Aziz naval air base, Saudi Arabia for Operation Desert Storm. This is the desert version of the squadron patch for the HMH-463 'Pegasus' out of MCAS Tustin, CA. They operate under the watchful eyes of MAG-16 and fly the Sikorsky CH-53A Sea Stallion transport helicopter in support of US Ground Forces. They were deployed to King Abdul Aziz naval air base, Saudi Arabia for Operation Desert Storm. 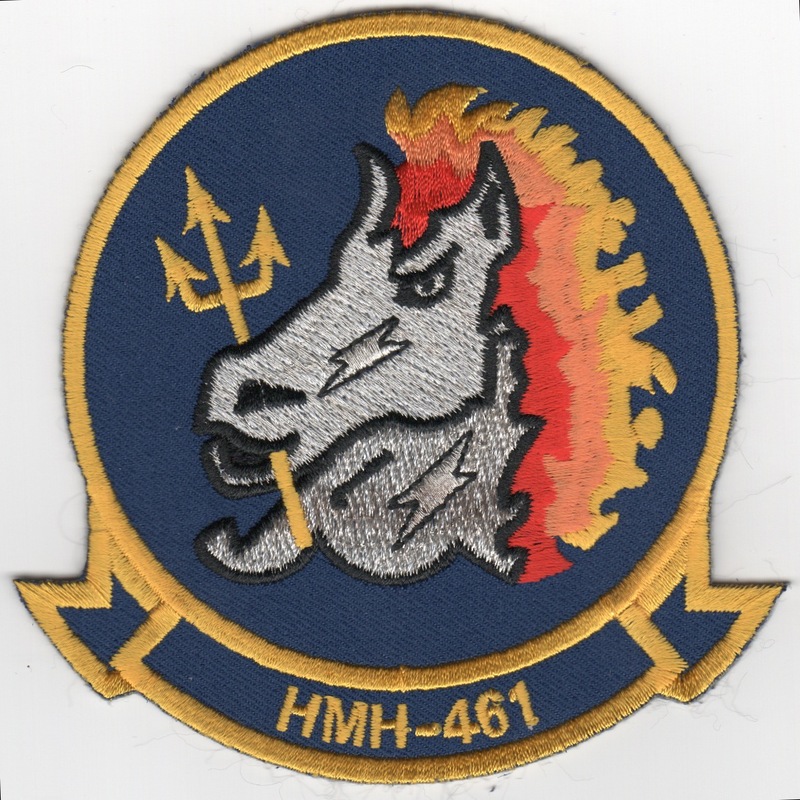 This is the subdued version of the "Pegasus" patch for the HMH-463 squadron out of MCAS Tustin, CA. They operate under the watchful eyes of MAG-16 and fly the Sikorsky CH-53A Sea Stallion transport helicopter in support of US Ground Forces. They were deployed to King Abdul Aziz naval air base, Saudi Arabia for Operation Desert Storm. This is the desert version of the "Pegasus" patch for the HMH-463 squadron out of MCAS Tustin, CA. They operate under the watchful eyes of MAG-16 and fly the Sikorsky CH-53A Sea Stallion transport helicopter in support of US Ground Forces. They were deployed to King Abdul Aziz naval air base, Saudi Arabia for Operation Desert Storm. 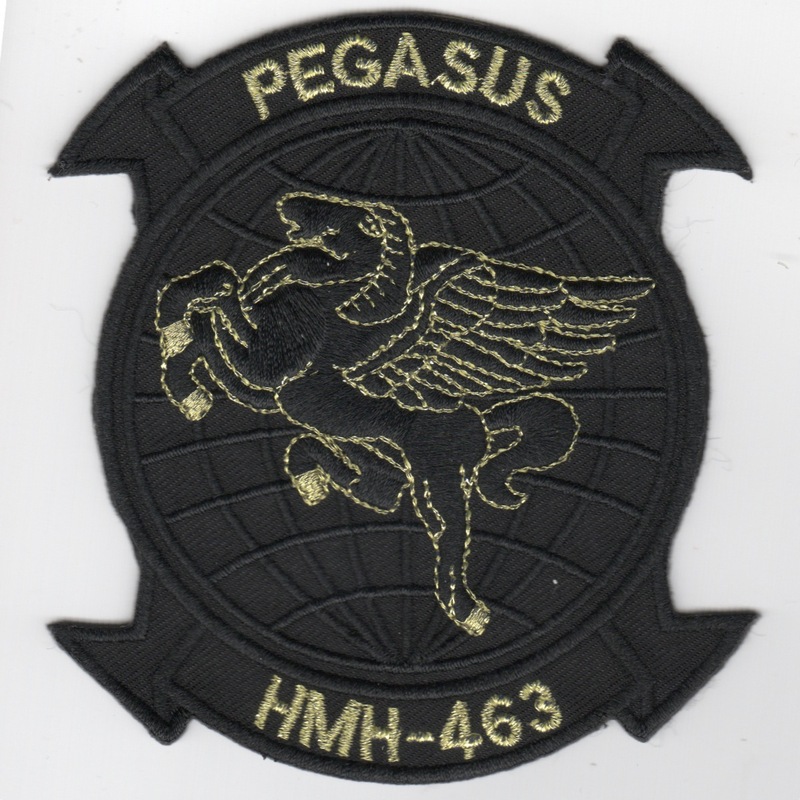 This is the black version (with gold letters) of the "Pegasus" patch for the HMH-463 squadron out of MCAS Tustin, CA. They operate under the watchful eyes of MAG-16 and fly the Sikorsky CH-53A Sea Stallion transport helicopter in support of US Ground Forces. They were deployed to King Abdul Aziz naval air base, Saudi Arabia for Operation Desert Storm. 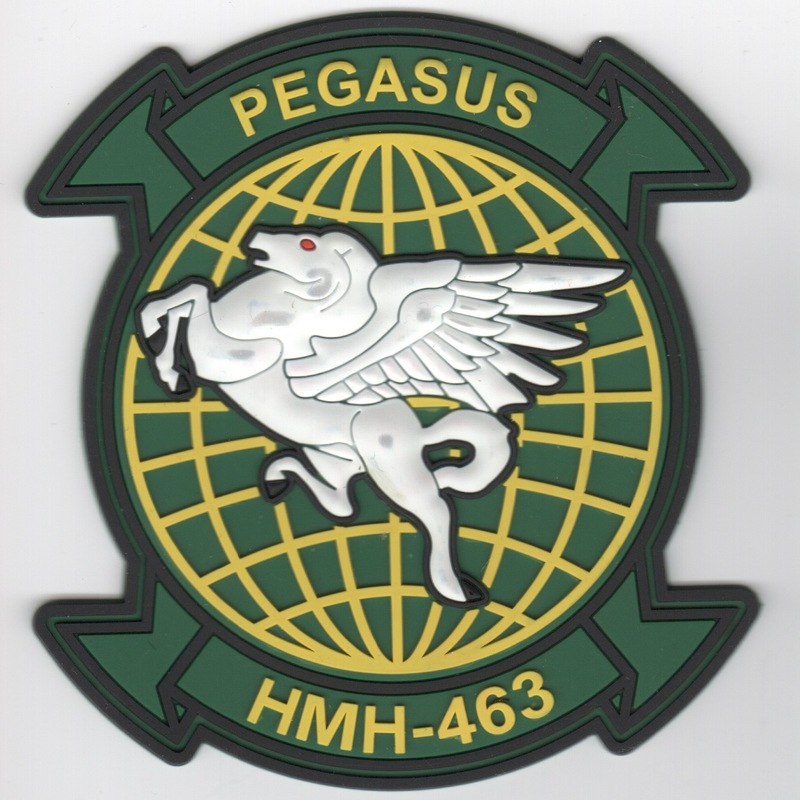 This is the PVC color version of the squadron patch for the HMH-463 'Pegasus' out of MCAS Tustin, CA. This patch does not come with velcro already attached. 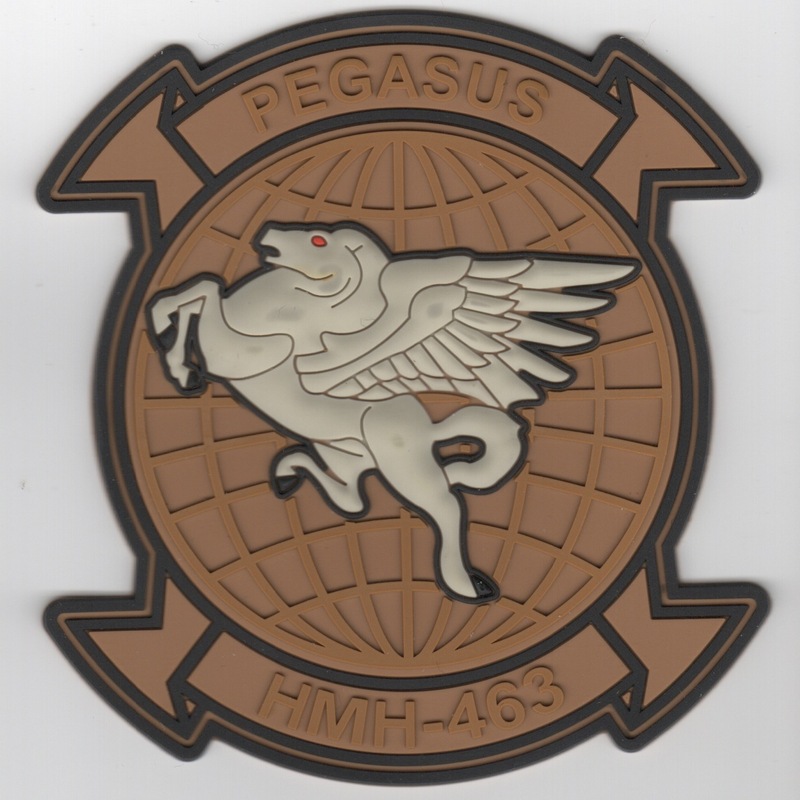 This is the PVC desert version of the squadron patch for the HMH-463 'Pegasus' out of MCAS Tustin, CA. This patch does not come with velcro already attached. 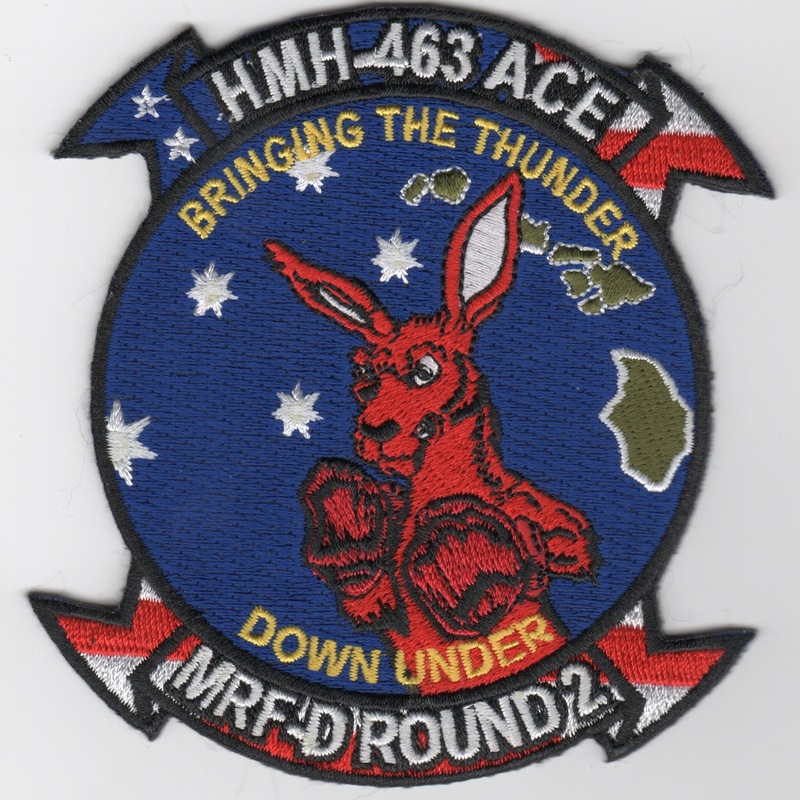 This patch was created to commemorate the exercise with Australian Force. 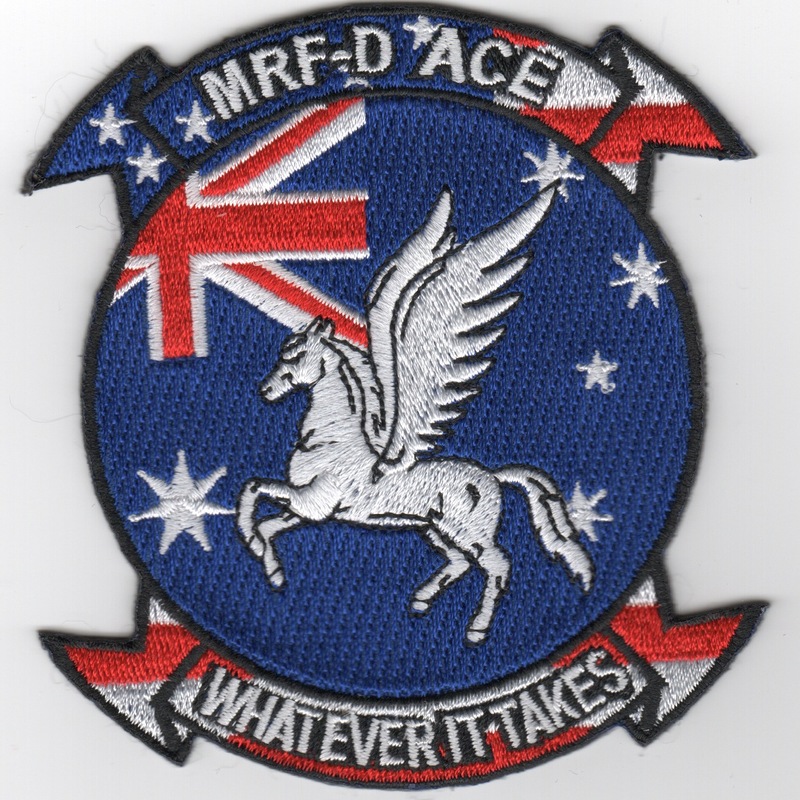 It says "MRF-D ACE" across the top and "WHATEVER IT TAKES" along the bottom with the Aussie Flag and "Pegasus" in the middle. 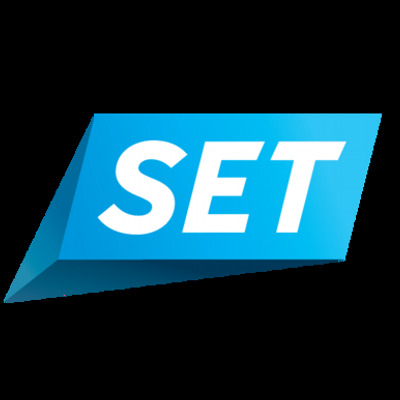 Service members at Marine Corps Air Station Kaneohe Bay departed here, March 25, to begin a six-month deployment to Australia�s Northern Territory as part of Marine Rotational Force � Darwin. Approximately 100 Marines from Marine Heavy Helicopter Squadron 463 (HMH-463) and Marine Aviation Logistics Squadron 24 (MALS-24), as well as four CH-53E Super Stallion helicopters partook in MRF-D as part of an Aviation Combat Element. This marks the first year in which such an ACE has been part of MRF-D. This patch was created to commemorate the exercise with Australian Force. 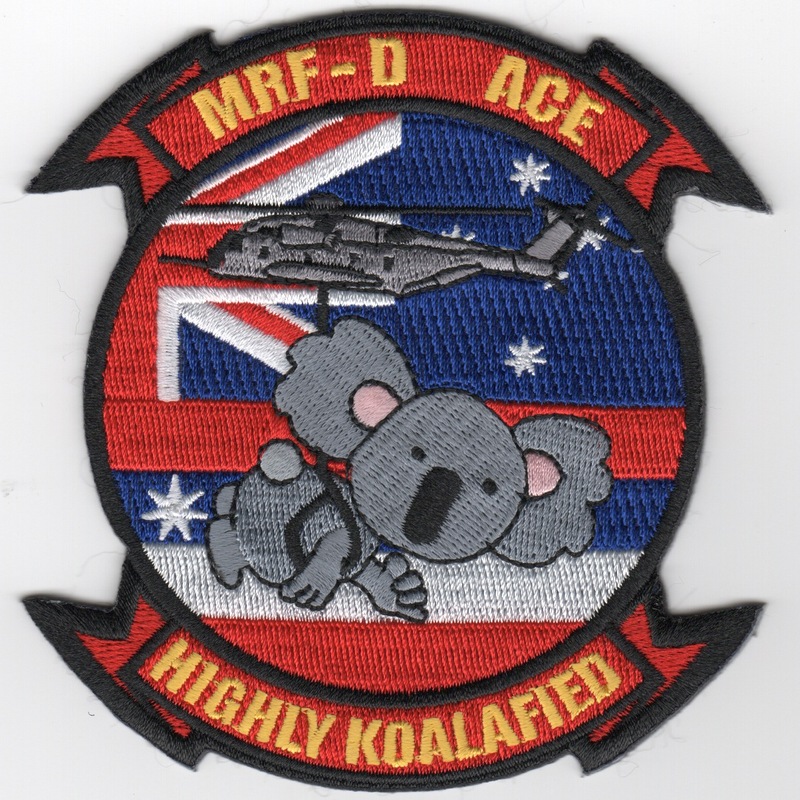 It says "MRF-D ACE" across the top and "HIGHLY KOALAFIED" along the bottom with the Aussie Flag and "Koala" in the middle. Service members at Marine Corps Air Station Kaneohe Bay departed here, March 25, to begin a six-month deployment to Australia�s Northern Territory as part of Marine Rotational Force � Darwin. Approximately 100 Marines from Marine Heavy Helicopter Squadron 463 (HMH-463) and Marine Aviation Logistics Squadron 24 (MALS-24), as well as four CH-53E Super Stallion helicopters partook in MRF-D as part of an Aviation Combat Element. This marks the first year in which such an ACE has been part of MRF-D. This is the 50th Anniversary patch created for the squadron. It says "50 Years of Heavy Lift" (in gold threads). It does not have velcro already attached. 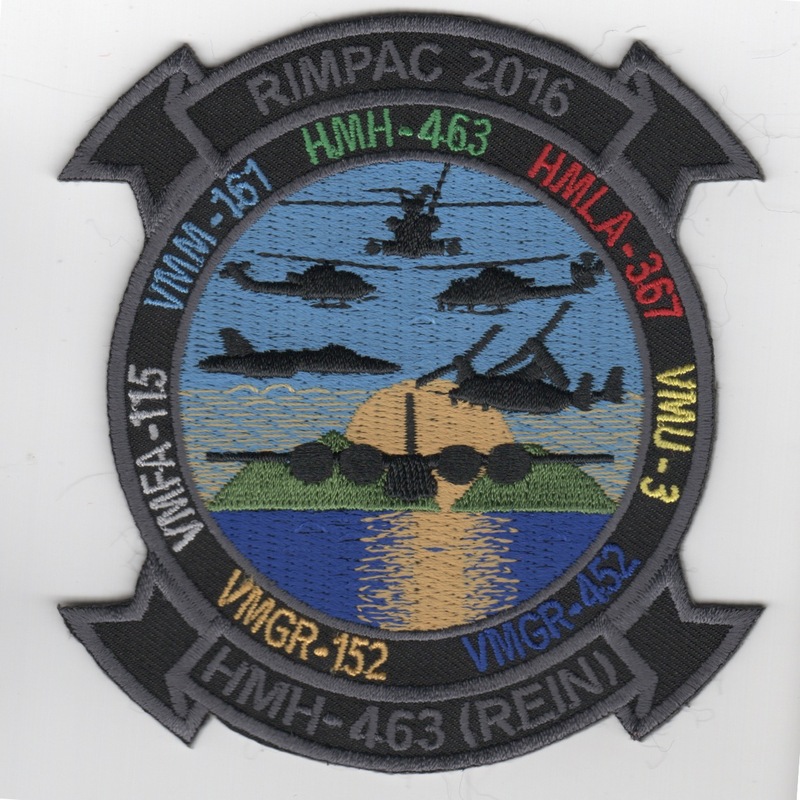 This patch was created to commemorate the 2016 Pacific Rim (RIMPAC) deployment with all the other units listed on the border of the patch. This patch does not come with velcro attached. Marine Heavy Helicopter Squadron 463 (HMH-463) is a United States Marine Corps helicopter squadron consisting of CH-53E Super Stallion transport helicopters. The squadron, also known as "Pegasus", is based at Marine Corps Air Station Kaneohe Bay, Hawaii and falls under the command of Marine Aircraft Group 24 (MAG-24) and the 1st Marine Aircraft Wing (1st MAW). This patch was created to commemorate the Hawaii detachment. This patch does not come with velcro attached. 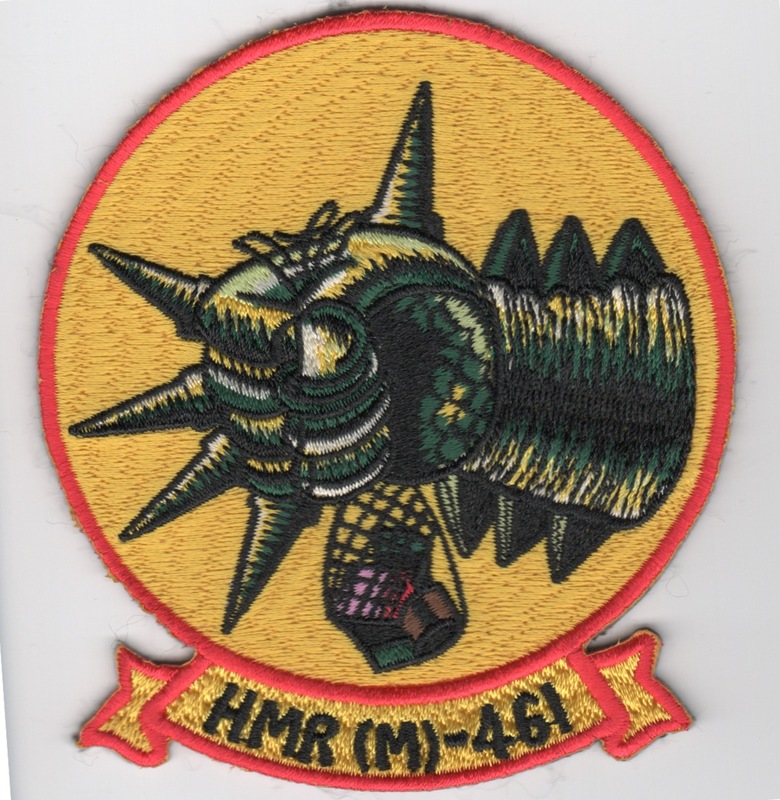 This is the subdued version of the squadron patch for the HMH-464 'Condors' out of MCAS New River, NC. They operate under the watchful eyes of MAG-29 and fly the Sikorsky CH-53E Super Stallion transport helicopter in support of US Ground Forces. This is the desert version of the squadron patch for the HMH-464 'Condors' out of MCAS New River, NC. They operate under the watchful eyes of MAG-29 and fly the Sikorsky CH-53E Super Stallion transport helicopter in support of US Ground Forces. This is the color version of the squadron patch for the HMH-465 'Warhorses' out of MCAS Tustin, CA. They fly the Sikorsky CH-53E Super Stallion transport helicopter in support of US Ground Forces. 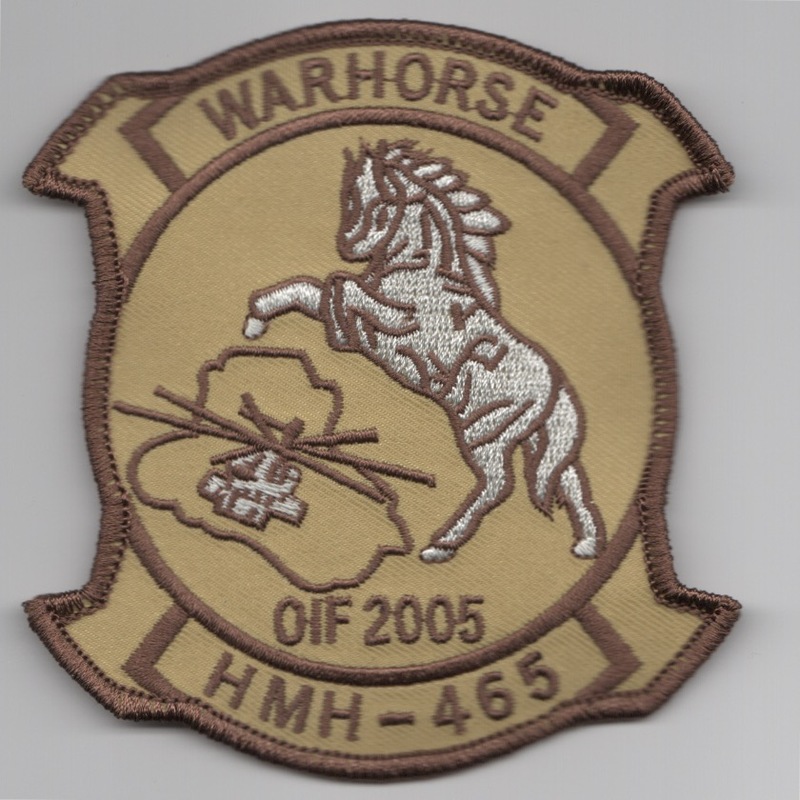 This is the subdued version of the squadron patch for the HMH-465 'Warhorses' out of MCAS Tustin, CA. They fly the Sikorsky CH-53E Super Stallion transport helicopter in support of US Ground Forces. This is the desert version of the OIF (Operation Iraqi Freedom) deployed patch for the HMH-465 'Warhorses' out of MCAS Tustin, CA. They fly the Sikorsky CH-53E Super Stallion transport helicopter in support of US Ground Forces. 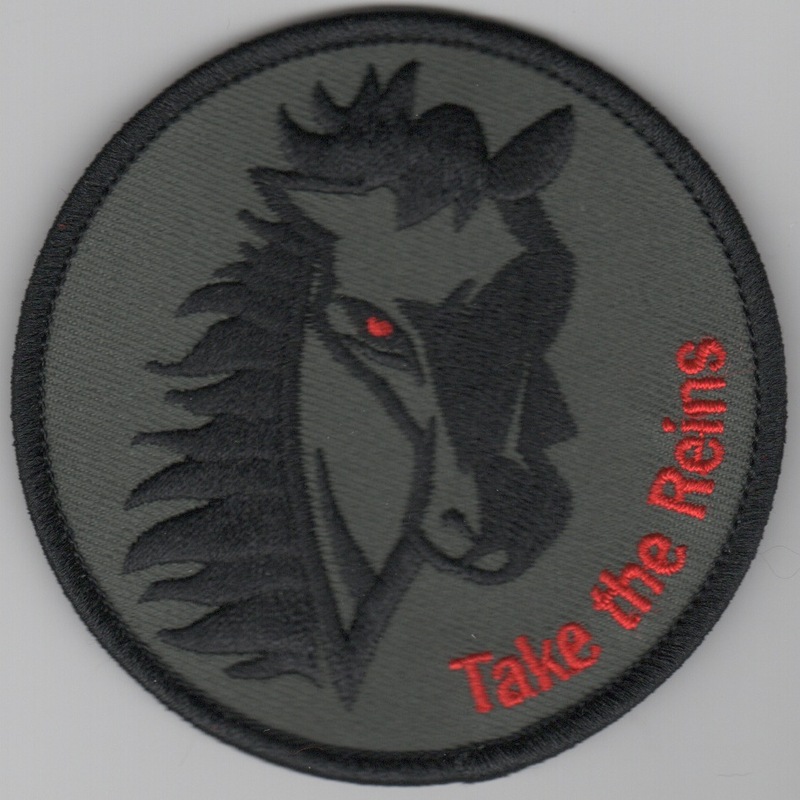 This is the subdued version of the "Take The Reins" deployment patch for the HMH-465 'Warhorses' out of MCAS Tustin, CA. They fly the Sikorsky CH-53E Super Stallion transport helicopter in support of US Ground Forces. This patch does not have velcro attached. 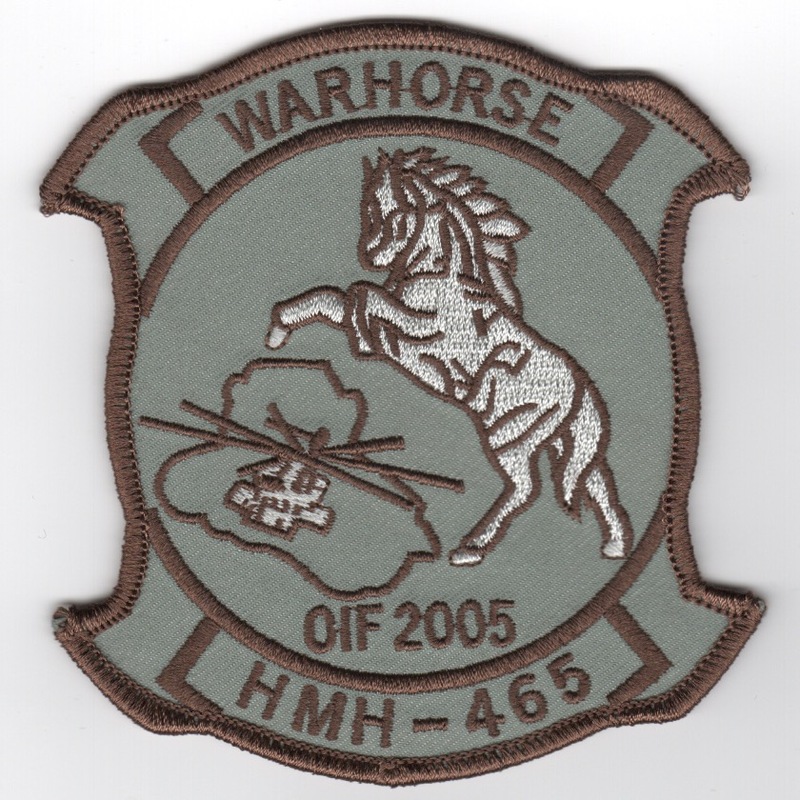 This is the 'desert' background version of the 2005 OIF Det patch for the 'Warhorses' that depicts the country of Iraq with the MH-53 helicopter. This patch does not have velcro attached. 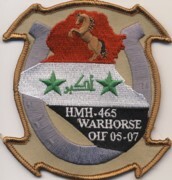 This is the 'steel-gray' background version of the 2005 OIF Det patch for the 'Warhorses' that depicts the country of Iraq with the MH-53 helicopter. This patch does not have velcro attached. Use this link to get both of the 2005 OIF Det patches at a discount. This is the black version of the '3-Wolves' squadron patch for the HMH-466 'Wolfpack' out of MCAS Tustin, CA. They fly the Sikorsky CH-53E Super Stallion transport helicopter in support of US Ground Forces. They operated out of Ras Al Gar during Operation Desert Storm. This patch come with velcro already attached. This is the desert version of the '3-wolves' squadron patch for the HMH-466 'Wolfpack' out of MCAS Tustin, CA. They fly the Sikorsky CH-53E Super Stallion transport helicopter in support of US Ground Forces. They operated out of Ras Al Gar during Operation Desert Storm. This is the black/gray version of the '1-Wolf' squadron patch for the HMH-466 'Wolfpack' out of MCAS Tustin, CA. They fly the Sikorsky CH-53E Super Stallion transport helicopter in support of US Ground Forces. They operated out of Ras Al Gar during Operation Desert Storm. This is the color version of the "Wolfpack" patch for the HMH-466 'Wolfpack' out of MCAS Tustin, CA. They fly the Sikorsky CH-53E Super Stallion transport helicopter in support of US Ground Forces. They operated out of Ras Al Gar during Operation Desert Storm. 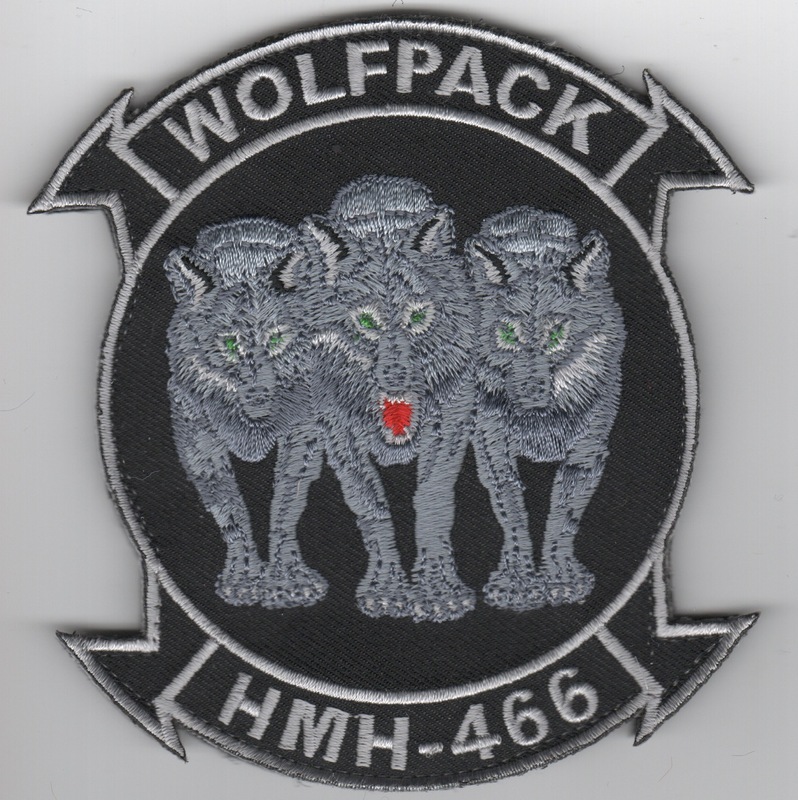 This is the subdued version of the "Wolfpack" patch for the HMH-466 'Wolfpack' out of MCAS Tustin, CA. They fly the Sikorsky CH-53E Super Stallion transport helicopter in support of US Ground Forces. They operated out of Ras Al Gar during Operation Desert Storm. This is the "Big Load" patch for the HMH-466 'Wolfpack' out of MCAS Tustin, CA. They fly the Sikorsky CH-53E Super Stallion transport helicopter in support of US Ground Forces. They operated out of Ras Al Gar during Operation Desert Storm. This is the "A.C.E.S." 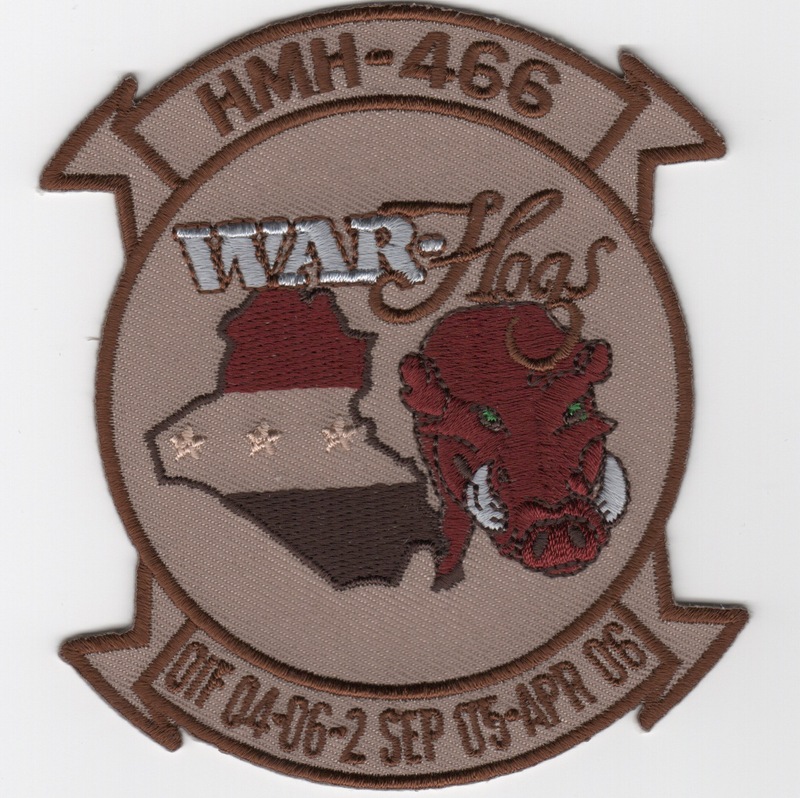 patch for the HMH-466 'Wolfpack' out of MCAS Tustin, CA. They fly the Sikorsky CH-53E Super Stallion transport helicopter in support of US Ground Forces. They operated out of Ras Al Gar during Operation Desert Storm. If anyone has any info on this patch, drop me a line. This is desert version of the HMH-466 2004-2006 OIF deployment. It says "War Hogs" and shows the outline of the country of Iraq with a Warthog head on the right.